Great Mitton is situated close to the confluence of the Hodder with the Ribble. 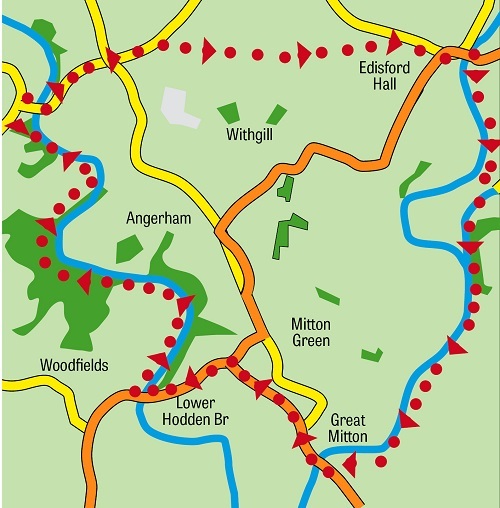 This walk allows you to explore attractive reaches of both rivers with a chunk of attractive countryside between. sometimes referred to as "Cromwell's Bridge" as it is surmised Ollie may have used it on his way to engage the Royalist army at what became known as the Battle of Preston. On the far side of the river turn right on a broad track. The next part of the walk follows the river from the Lower Bridge to the Higher Bridge. It is one of the most delightful riverside ambles in the country. The track edges alongside a broad meadow and as it climbs the slope leading to Hodder Place - the prominent building in sight from the riverbank - enters woodland. After passing the rear of Hodder Place the route descends to a substantial stone bridge. and then makes its way upstream with wooden footbridges at regular intervals. on the final stretch to Higher Hodder Bridge. After edging round the wall of a property the path arrives on a lane. Turn right and cross the bridge. 2. The road climbs away from the river. At the junction keep ahead and continue along the quiet lane for 350yds to where the lane bends slightly left. Here look for a stile on the right. After crossing it the path which is none too distinct follows the field boundary alongside a huge slurry pit and continues down a slope to a junction of ways. the path bears left to a gate leading onto the lane. Turn right and then at the junction with New Lane (B6243) turn left and descend to the River Ribble. and continue on a narrower path close to the river. Keep on it as it climbs the embankment and then edges round a field now away from the Ribble. The enclosed path takes you to a kissing gate. Through this turn left onto a farm road and then right onto a service road which leads past a waste disposal site on the left. Keep on the road as it takes you to Fishes and Peggy Hill Farm. After passing a farmhouse on the right the way cuts a corner through a kissing gate on the right in front of the barn. (It may be easier to keep on the farm track here.) Continue to the right of the barn as you leave the yard to enter riverside meadows. keeping well to the right as there is no pavement to Mitton Hall and Church Lane.